Praise God in the mountains. Praise him in the hills. Give glory to him everywhere, for he is merciful, good and just. And I am going to be candid for what I am about to say, because I am sure you are wondering why you are reading this article on LookingtoGod.org instead of JackFlacco.com. When I started my blog in December 2012, I was writing about zombies and I was looking to find an audience who would enjoy reading posts about the undead and the science behind it. One such post had to do with the various phases of rigor the body goes through during its decomposition. Never did I think how influential my posts would be until one night I had over 1,200 hits in an hour from people who were searching for the answer to the question, “Why do zombies eat brains?” And never did I think my first zombie book would end up as a bestseller when it came out in October 2013. As the years went on, my measure of success was by how many followers I had on Twitter, how many likes I had on Facebook, and how many readers I had on JackFlacco.com. Everything became a numbers game. If I could grab the audience’s attention, I will have earned their loyalty. Or so I thought. That is, until February 2016. For it was then that I realized God was working with me, shaping my heart, and moving me to forgive all those who I believed had done me wrong. I read a lot about repentance. I read a lot about forgiveness. I was going through a transformation, leaving behind old grudges to live a new life filled with Jesus. I emerged two months later as the proverbial new man. No longer was the weight of hatred holding me down, but I had the Holy Spirit guiding my decisions, showing me things in the bible I had never seen before. Two-and-a-half years later, after having written countless articles about salvation, and having published my first Christian book, I am announcing the birth of Looking to God Ministries, an organization dedicated to drawing people closer to God by encouraging them to love others as themselves and to love Jesus. We have yet to write a mission statement, or come up with branding; but those things are on our list of things to do. 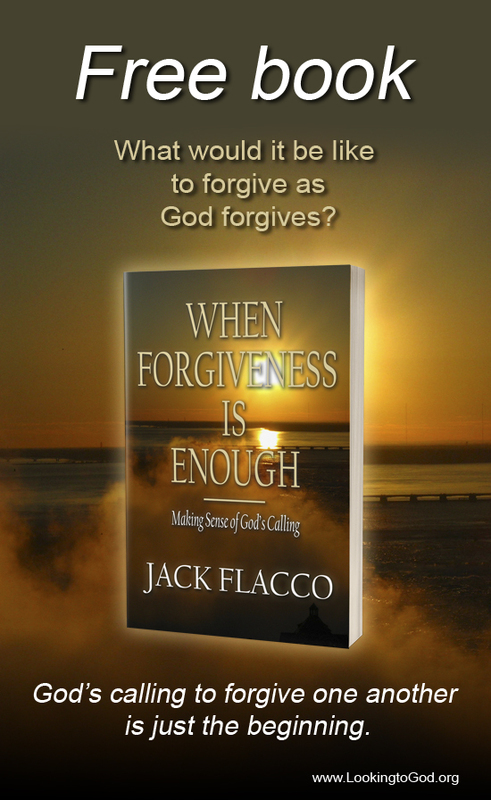 The exciting news is we have a homeless outreach program already up and running; and starting with When Forgiveness Is Enough, I will be signing over the rights, royalties and proceeds to all my books to the ministry as a means to support its programs. So I am thrilled to begin on this new journey, sharing this experience with you all, and wondering what God has waiting for Looking to God Ministries in the next little while. I am sure that whatever he has planned, it will be a time of challenges, moments of excitement, and opportunities to draw closer to him. Please join me in prayer that I may know what his will is.